Home > Investments > Which Debt Mutual Fund Is Good for You? Choosing a mutual fund, be it equity or debt mutual fund is not an easy task. There are some funds that give higher returns but put your capital at risk, while some others generate moderate returns but protect your capital from losing value. Moreover, there is a risk of choosing a wrong alternative as well, which may result in a lower return. In such a situation, we tend to gather as much information as possible to make a more informed decision. However, it is never enough. In some situations, it opens a door to a new world with its own set of complexities, which leaves us wondering whether we will be able to decide on which fund to invest in. How to Choose a Best Debt Mutual Fund? From an outer perspective, it looks difficult to decide on one fund type. However, like any other decision, when you break the entire investment decision into small chunks and tackle one chunk at a time, the decision-making becomes easier. In the process of doing so, you need to find answers to the following questions. Question 1: What’s Your Objective? The first question you need to ask yourself is why do you want to invest? What is the objective of your investment? Do you want to protect your capital or create wealth by investing for the long-term? Are you looking to generate regular income from the investment or do you wish to fund your child’s education? Are you worried about your life after retirement? Are you looking to capitalize on the real estate or technology boom? Alternatively, do you want to have the best of everything? These are the kinds of questions that will give you an idea of your investment objective. Question 2: What is Your Risk Appetite? Just knowing your objective is not enough. You need to know how much risk you can take? You can find this by asking yourself questions such as, do you consider yourself an aggressive investor who has a capacity to take a bigger risk or are you a person who gets jittery even at the prospect of losing a small sum? Are you a person who can take some risk but want some protection for your capital? Risk appetite of a person depends on the age, income, liabilities, field of work, and a number of dependants. If you are a young person with little or no liabilities, working in an industry that offers a stable income and has a potential to grow in the future then your risk appetite is higher than the ones who are in late-thirties with school-going kids and employed in a stagnant industry. Risk appetite depends on all four factors mentioned above. One factor alone cannot give you an accurate understanding of your risk-taking capacity. Question 3: What are Your Financial Obligations? Although a majority of mutual funds offer quick liquidity, not all funds provide this luxury. Some of them have a pre-set lock-in period while others are matured in a day. So, you need to ask yourself this question: when will I need the money and for what? The “what” part of the question will help you know your immediate and future financial obligations. Question 4: How do You Want to Invest and How Much? Do you want to invest a lump sum amount or do you wish to take a SIP (Systematic Investment Plan) route to create your future wealth? One can make a better investment decision by devoting a considerable amount of time finding answers to the above questions. The answers will vary from person to person and so will the choice of mutual funds. Equity, Debt or Hybrid: Which fund is good for you? If you want to grow your capital then equity schemes are what you should invest in, but if capital protection is more important to you than returns then debt mutual fund schemes are your friend. Hybrid funds are for those who want the best of both worlds. When considering these scheme types, it must be noted that not all types of equity, debt, or hybrid funds will offer the same returns with similar risk appetite. Some will always give bigger and better returns, some will be the safest, while some will always balance the two extremes, in each of the categories. 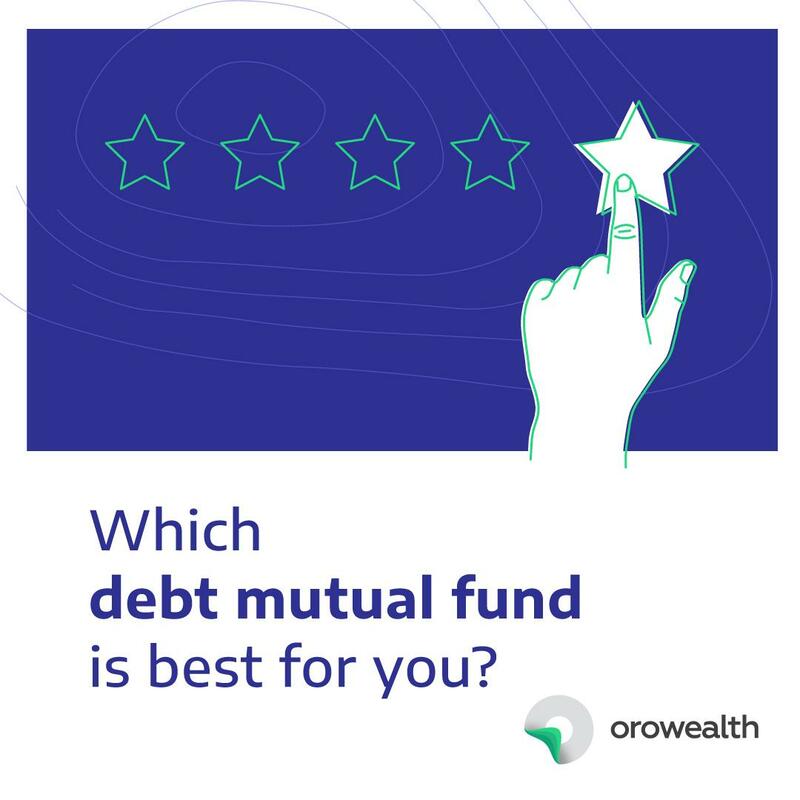 Which Debt Mutual Fund is Best for You? Unlike equity schemes, the returns on debt mutual fund depend largely on the interest rate scenario, so investment in a debt mutual fund scheme has never been a favourite among retail investors. However, there are cases where investing in a debt mutual fund makes more sense than investing in other types of mutual funds. The underlying goal of any debt mutual fund is to protect your capital and give you money when you need it while offering you a decent return on your capital investment. The fund category has been sub-divided with this goal in mind into categories like overnight, liquid, ultra-short duration, low duration, short duration, medium, medium to long duration, and long duration funds. There are funds with higher risk such as Credit Risk funds that invest in riskier bonds (less than AA-rated). On the other hand, there are low-risk funds such as Gilt funds that focus on government bonds and securities. You need to revisit the 4 questions asked above to decide which debt mutual fund is good for you. Unless you know your financial objectives and obligations, you will not be able to find the right debt mutual fund for you. There is a chance that you might end with lower returns than expected. You need to keep your long and short-term financial goals and obligations in sight while deciding on a debt mutual fund. Having said that, it is imperative that you do your research before investing in credit risk funds. The asset allocation of this category defeats the whole purpose of the debt mutual fund, which is capital protection. Yet, if you want to take a bit of risk and get a better return on your investment in debt mutual fund then you should consider investing in corporate bond funds and dynamic bonds. Why Should You Invest in the Dynamic Bond Fund? A dynamic bond fund responds to interest rate scenario. A fund manager of a dynamic fund may shuffle the asset allocation between different debt instruments as per their interest rate forecast. It offers optimal returns in all market conditions. In other debt funds, there is a fix time duration for which a certain asset can be purchased. This requirement is waived for dynamic bonds. Fund managers can invest in long-term securities for even a month. While investing in a dynamic bond fund, one should keep in mind that the fluctuations in the interest rates affect the overall returns. It also affects the tax applicable on your capital gains. One should not invest in dynamic bond funds if the investment horizon is less than 3 years. It works best for someone who has the capacity to invest for a period of 3-5 years. Should You Consider Hybrid Funds As Well? For an investor who does not feel too sure about equity funds and is not satisfied with the returns offered by debt funds, hybrid schemes offer solutions that will match their investment objectives. There are six kinds of hybrid mutual funds to choose from and based on your risk profile, you can choose a hybrid fund that focuses primarily on equity market or one that focuses largely on the debt market. It is suitable for new investors who do not feel comfortable in jumping right into a riskier terrain of equity schemes. As it invests 65% to 80% of its total net asset in equity and equity related instruments, funds in this category get a capital gain benefit allowed for equity-oriented mutual fund schemes. A 20% to 35% exposure to debt instrument safeguards capital invested. This works as a motivating factor for new investors. There is another offshoot of this scheme, Balanced hybrid fund. It invests 40% to 60% of its total net assets in debt instruments and the remaining in equity related instruments. The risk and reward are lower for this fund. An investor looking for even safer investment vehicle should consider conservative hybrid fund. It invests 75% to 90% of its total net asset in debt instruments. Are other two categories worth your effort? SEBI’s recategorization exercise has introduced solution-oriented schemes like retirement fund and children’s fund to the market. These funds can help you to reach your goals. However, it might be more beneficial to invest in traditional debt funds. The returns offered by these are comparable to the new schemes, and they have a proven track record. ETFs and FoFs have failed to catch investors’ fancy in India. It is thus advised not to make these funds your gateway to the mutual fund world.